Surprisingly compared to the 2017 season(16 games played) there were comparatively fewer games played. This was due to a run from the middle of June to the end of July. Boyne Hill cried off late on 17th June and The Fiddlers again cried off late for the first Sunday of July. The 15th was cancelled due to the World Cup final and it actually poured down on the last Sunday of July! My thanks to Tom Wilding and Bally who filled in on captaincy duties whilst I was injured for the first two Sunday games and James Bowler, who captained against Dave Smart's X1. In total 43 players were used in the 13 games. Rich Lawrence - Good to see him back playing and making rare Sunday appearances. Against the mainly lessor Sunday bowling there was no blocking just attacking! Aggressive runner between the wickets and gun fielder. Lowest score of 34 in four innings. Sean - Made hay whilst the sun shined! After literally a freezing start v Regals runs eventually flowed both on Sundays and in the league. Two hundreds and two fifties after starting with three low scores. 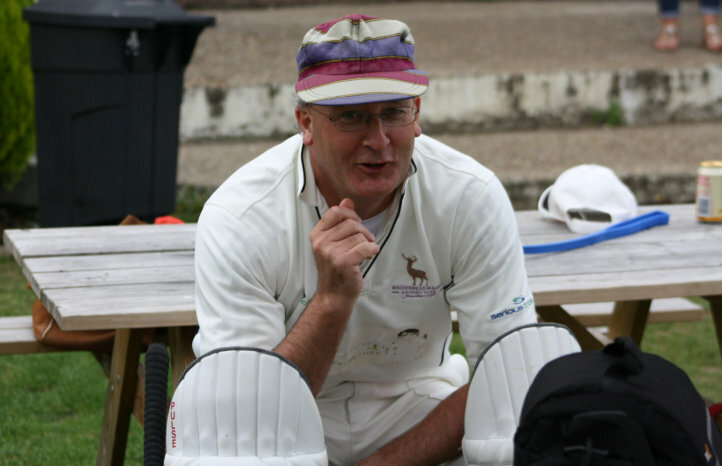 Spring Bank Holiday the turning point, 50 in league, 50 on Sunday and undefeated century on Monday(first one ever). Another top fielder(in comparison to the general poor Sunday fielding), helped out with coaching and bar and social backbone of club, top bloke. Bally - fine last game of innings of 95. Gunbarul - As ever a reliable middle order performer, usually achieved at a high tempo. Reaper - surprise addition courtesy of 47no in last game, highest score since 2002. Ben Ward snr - Mirrored league performances, strength is a weakness(often out hitting over the top). Cameo innings of 35 opening against the quicker Frogs bowlers. One exquisite cover drive prompted scorer to shout "batsmen's name!" Harry Blackwell - man of the match performance with bat and ball v David Smart's X1, also breath taking catch off his own bowling. Krish Vaja - promising bowler, may need to straighten his arm, bowls wicked Waqar yorkers. Fred Truman once said" To be a great fast bowler you need a big heart and a big bottom"! Gunbarul - Mr Reliable, when either opening bowling, first or last change, invariably picked up a wicket and usually economical. Reaper - only bowled the maximum 8 overs twice. Not as economical this year, albeit tends to bowl at death. Ambar Moorthy - Steady opening bowler who deserved considerably more wickets. Generally made a breakthrough and economical. Normally bowled straight through, no second spells. Chris Butler - not as good as previous seasons but still did a job. Strangely went over two months between games with all the cancellations during June / July. Swapnil Manchanda - first Sunday season for M &B. High economy rates but worked well when bowling in tandem with Chris and GT. Needs to eradicate the full toss from his repertoire. Plays every week, reliable bowler, handy batsmen and safe fielder. Step forward Gunbarul. Obviously not as successful as last year but almost won as many games as we lost. With Sunday cricket continuing to decline, indeed at a number of large clubs there are only a handful of games, M & B has a comparatively strong fixture list. Next year fifteen Sundays fixtures are proposed with one Bank Holiday Monday game. The list will reflect the months where availability is better(free Sundays in May & June and games every Sunday in July & August apart from Bank Holiday Sunday - Lord Taverners). Three early season games(last Sunday in April and first two in May) giving players opportunity of early season practice games. Free Sundays in June giving ladies opportunity to play games on main square. My thanks to all the players who supported me during the season, especially my regulars. To Pete for umpiring, as well as Tim, who kindly stood in the final game. To Brian for his lovely teas and for putting the tables and chairs away(you don't know how much hassle that was last year), and to Charlie for preparing the wickets and putting these reports on the website and facebook.